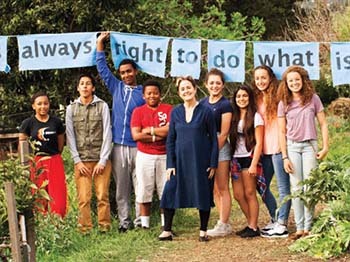 This year, prolific chef and activist Alice Waters celebrates the 20th anniversary of her K-12 education curriculum, The Edible Schoolyard Project. But two decades ago she was wasn’t so sure her big idea would come to fruition. Waters didn’t expect to hear from Smith again. “Four months later, he got back to me, and he said, ‘We’re ready to do it,’” Waters says. Twenty years later, King School’s garden is a demonstration site for The Edible Schoolyard Project, which includes curriculum resources, a global network for educators and an annual staff-training program called The Edible Schoolyard Academy. It can be argued that programs like the one Waters co-founded have influenced today’s Gen Z diners, 53 percent of whom say that sustainable foods affect their choice of foodservice locations, according to Technomic. We spoke to Waters, who in September was honored by President Obama with the National Humanities Medal for her work in sustainable food, about challenges past and present, in schools and beyond. I had been a Montessori teacher, and it came to me that the only way we’re going to bring children back to the earth is through the public schools. The idea behind [ESY] is definitely experiential education. It’s taking the principles of Montessori, educating the whole child and [the idea that] the senses are the pathways into your mind. You really want the students to really be touching and tasting and smelling and seeing, so we take every academic subject, and we use the classroom of the garden or the kitchen to bring that subject alive. This is not a gardening and cooking class, per se. This is, in fact, a dramatic-arts class that’s taught through improvisational cooking in the kitchen. Using food and agriculture as a way to open children’s minds is just naturally sort of seductive to them because we need the nourishment. Everybody needs to eat to be alive, and you feel the overwhelming connection to nature. I think you need to go to the top first, which is what I’ve done in every project that I’ve been involved with. You really want to know that it is the principal or the superintendent of schools, that they believe in this and that there are teachers within the school [who also do]. I love to gather people in the beautiful circumstances of a garden to have a conversation. I never go anyplace unless I bring a basket of strawberries or some mint tea or the simplest things, and I put them on the table and I’m trying to engage the administrator the way that I would the children. They’re never honored in the way that they should be, and we’re trying to lift up the status of those teachers and the farmers. So it was such a strong push for me, a belief that this was the right place and this was the right time and I just have never looked back. I got a car to come home last night, and I was telling [the driver] I was going to [Chez Panisse] and said, “Have you ever heard of it?’” He said, ‘“No, but I used to go to school over in this area.” I said, “Where’d you go to school?” He said, “I went to King.” Then, just unsolicited by me, he said, “That was the greatest time I had in school ... I remember digging in the garden,” and it brought tears to my eyes. This is the first year that we have hired somebody [chef teacher Molly Rose-Williams] to teach who has been in the program. We have a little movie that we made of eighth graders leaving the program this year, and to hear them talk, some of them could give a TED Talk. It’s quite astonishing that they get it completely, and in this 20th year, we’re reaching out to find the alumni. We’ll see what we get, but I’m pretty impressed with what they go on to do. I think the biggest challenge is the willingness to pay the real cost of food upfront for children’s health. It can be affordable, but it can never be cheap. Because if it’s cheap, somebody is losing out, and most often, it’s the farmer. We need to focus on the fact that nutrition begins in the ground. And, yes, in the Healthy Hunger-Free Kids Act, they’re talking about allowing gardens and buying from local gardens and that, but are those gardens organic? Are they really? We’re not understanding that we have to pay the real cost of food. Five cents, a dollar won’t help. We need $5 for every child. We want to support the farmers who are taking care of the land, and they need to be paid. We need a direct line from the farm to the table. Fast-food culture says cooking is drudgery. And I’m saying that cooking is a great pleasure. Maybe there was a time when the wife had to go in the kitchen and do it all herself and nobody was helping. But now, we have family and friends who want to cook together. And we all clean up together and this is a beautiful thing. We bring children to the table and older people to the table, and we sit down and have a moment in the day. As things get faster and faster, we need that time to take a breath. Alice Waters and Principal Neil Smith break ground on the first Edible Schoolyard at Martin Luther King Jr. Middle School in Berkeley, Calif.
"It's just amazing, the idea that Alice had long before it caught on nationwide. … Getting people thinking again about where our food comes from and how we can set up a more sustainable system. For a lot of urban kids, they really don’t have that awareness or experience. And I think the garden, the kitchen, the whole Edible Schoolyard Project was such a boon." —Neil Smith, former principal of Martin Luther King Jr. Middle School in Berkeley, Calif.